It might be hard to believe, but it’s been a whole decade since the first live-action Transformers movie clanged its way into theatres. In this fifth go-round, the Transformers have been declared enemy combatants and are hunted by the Transformers Reaction Force (TRF). Cade Yeager (Wahlberg) is a wanted fugitive for aiding and abetting the Autobots, including Bumblebee. He rescues young orphan Izabella (Moner) from a firefight, and in the process, is gifted a talisman by an alien knight whose ship crash-lands on earth. Cade is summoned by Sir Edmund Burton (Hopkins), the guardian of a sect sworn to protect the Transformers’ secret history on earth. It turns out that the wizard Merlin (Tucci) was bequeathed a magical staff by alien robots; the mythical object long vanished. Cybertronian sorceress Quintessa (Chan) sends Optimus Prime (Cullen) in search of the staff, turning him against his long-time allies. With the help of Oxford literature and history professor Viviane Wembly (Haddock) and reluctant TRF soldier William Lennox (Duhamel), Cade and Burton must unravel an ancient conspiracy to prevent the destruction of earth. 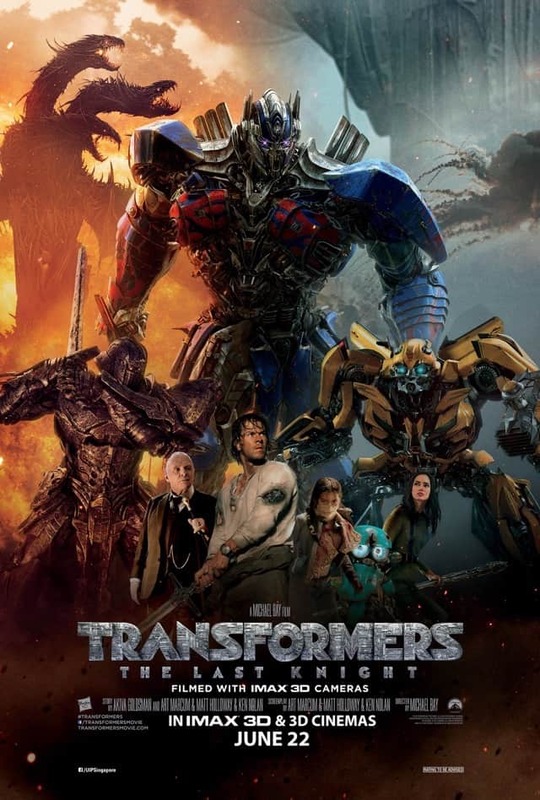 No other franchise in recent memory has been more critic-proof than the Transformers films. This summer alone, we’ve witnessed King Arthur: Legend of the Sword and The Mummy feebly attempt to kickstart would-be franchises, while this juggernaut based on Hasbro action figures trundles along. The Transformers movies have long been easy targets for critics, and this entry is particularly frustrating for us. The Last Knight does what this reviewer has always wanted from this series: it explores the alternate history built around the Transformers’ secret presence on earth – though it’s hard to imagine how giant alien robots can stay secret for too long. However, this ends up being expectedly ludicrous, with plot contrivances that beggar belief scattered throughout the film. It turns out that there is a Da Vinci Code-esque secret society entrusted with guarding said history, its members including William Shakespeare, Leonardo da Vinci, the Wright Brothers, Harriet Tubman, Albert Einstein and Stephen Hawking. How giant alien robots traipsing around are kept secret is anybody’s guess. This film strikes us as a spectacular waste of resources – with its $260 million budget, it’s the most expensive Transformers movie yet. In a way, every big blockbuster is, but some are better at justifying that waste than others. The Last Knight unfolds on a spectacular scale, and like Age of Extinction, its story spans continents and millennia. The visual effects supervised by Scott Farrar are extensive and commendable, and the action set pieces are marginally easier to follow than in previous instalments. However, there are only so many ways one can depict giant robots punching each other, and there are only so many variations on a car chase. While rival car-based franchise Fast and Furious has been continuously inventive, the action in Transformers is concussive and numbing. There’s so much going on that it’s easy to tune out instead of staying focused on the mayhem onscreen. We held out hope that this might be an improvement because screenwriter Ehren Kruger has been jettisoned, replaced by Iron Man and Punisher: War Zone scribes Art Marcum and Matt Holloway, and Black Hawk Down writer Ken Nolan. Alas, narrative coherence is in short supply and director Michael Bay’s oppressively juvenile sense of humour smothers anything resembling wit. There’s a scene in which Megatron (Welker) negotiates the release of his Decepticon compatriots with lawyers seated at folding tables in the middle of the desert. We also find General Morshower poring over battle plans in the Pentagon basement, declaring “this is where I deal with the dark s***”. And yes, there are racial stereotypes aplenty – Bay is endlessly amused at those stuffy Brits, Hot Rod (Sy) has a thick French accent, gold chain-wearing Decepticon Nitro Zeus (DiMaggio) paraphrases Martin Luther King Jr. while being released from prison, and Decepticon Mohawk (Reno Wilson) is characterised as a violent street thug. Any accusations that critics are “reading into things” are rendered moot by Bay’s insouciant rejection of subtlety in any form. Wahlberg may be a better fit as the franchise’s leading man than Shia LaBeouf was, but even then, Wahlberg’s getting annoying. It’s a relief, then, that this is supposedly his last Transformers film. By making the female lead an Oxford professor, the film goes down the predictable route of having Cade and Viviane bicker endlessly while being set up as a couple. Haddock is by far the best actress to have played the female lead in this series, but that’s a low bar. She’s also the least overtly sexualised and has the most agency of all the female leads in the series – but that’s also a low bar, seeing as Viviane struts around in tight dresses and stilettos for the first half of the film. With Izabella and her sidekick, transforming Vespa Sqweeks, Bay appears to steer the film back to the “a kid and their X” roots, as embodied by Sam Witwicky’s friendship with Bumblebee in the first movie. This feels like an afterthought, and Izabella is one of several characters who feel like hangers-on. After starring in HBO’s Westworld, Sir Anthony Hopkins hangs out with far bigger robots here. He looks to be having a grand old time, playing the eccentric earl with a twinkle in his eye. A lot of his dialogue is incredibly stupid, but it helps that it’s being uttered by Hopkins. Burton is given a sidekick in the form of an idiosyncratic robot butler named Cogman (Carter), who is frequently annoying and is pretty much a more annoying version of Rogue One’s K2-SO. Duhamel, Morshower, Turturro and others return from the earlier movies, begging the question of why LaBeouf isn’t in this, at least for a little. Not that we want to see him in this at all, but given that Sam is Bumblebee’s best friend, it stands to reason that Bumblebee should seek him out over the course of this film. To its credit, The Last Knight does feel shorter than its 150-minute runtime, and features a novel submarine chase that’s different enough from the standard action sequences we’ve seen from this franchise. It’s fine for blockbusters to be silly, but when nothing less than the end of the world is at hand, The Last Knight should be more impactful and less superfluous than it is. Summary: Bombastic and bloated, The Last Knight’s convoluted mythos and tedious action is enlivened by the joyous presence of Sir Anthony Hopkins. Audiences with the fortitude to surrender to its thunderous stupidity might get a modicum of enjoyment out of this.